Victory spreads are a powerful way to make money with options. They are an extremely low risk trade but with unlimited profit potential. It's potential "return on risk" is massive, which means that you only need a few of these to work out for you each month and it's almost impossible for you not to make an overall profit. This option spread is an option trading strategy that was developed by a veteran trader of 30 years, who ran a brokerage firm in New York city. He was going to retire but decided not to. Instead, he now runs a small hedge fund that only uses the Victory Spread strategy. You may have heard of back-ratio spreads (some call them 'vacation spreads'). The Victory Spread is similar to this strategy, but is much more favourable to the person putting it on than a back-ratio spread. You can risk as little as $20 to $60 on one of these trades, but when they pay off, the return is in the thousands. You can also make a small profit when the underlying price action doesn't move north as expected - and even if it really tanks you might lose around $15. It's almost a risk free trading strategy! The best stocks to use this strategy on, are ones currently in the news, or that you believe may be due for a large move to the upside before the expiration date of one leg of the option spread. A prime target would therefore be, companies which are due to release favourable Earnings Reports in the near future. But companies with rumours around about being possible takeover targets are best for this particular strategy, because once the bid is made, the price invariable goes up quite dramatically. You can just "set and forget" these kind of trades, because one leg of the trade involves a long dated option. You can also take positions where the prospective outlook is either to the upside OR the downside - in other words, using both call and put options. The secret to profitable Victory spreads, is how you structure them. It's not a difficult or complex operation - very simple in fact - but you will need a brokerage account such as ThinkorSwim which allows you to graphically analyse your trade before you execute it. If you're not with ThinkorSwim, you'll need some other options analysis software, or a broker that provides risk graphs. If you don't want to pay for this, you can get a free Excel based options strategy evaluation tool by Peter Hoadley that gives you a nice pay-off diagram. The Victory Spread is explained fully in module 11 of the Trading Pro System - a series of downloadable videos that teach you a number of safe and consistently profitable option strategies for regular monthly income. 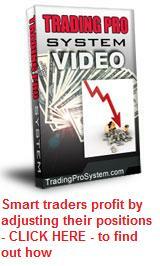 However, if you don't want to pay the full price of the complete Trading Pro System package, they are also selling a singular video exclusively about the Victory Spread for only $27. Believe me, if you know how to use this strategy, that price tag seems a small price to pay for inside knowledge about a virtually zero risk option strategy with massive profit potential.